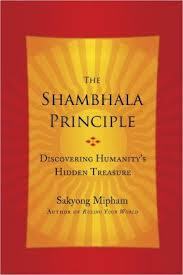 Sakyong Mipham – the head of the Shambhala lineage – has just published a new book, The Shambhala Principle: Discovering Humanity’s Hidden Treasure. This book is devoted to the principle of basic goodness and enlightened society. It was written, the Sakyong says, as a dialogue with his father, the legendary Chogyam Trungpa Rinpoche, who presented the principle of basic goodness as the foundation for creating a sane life and a sane society. The book includes chapters on the relevance of the Shambhala principle to economics, politics, medicine, and the environment. “You can use these chapters to bring the principle into your life and use them in discussions with friends,” the Sakyong says. Right now we are at a time, globally, where many of us are wondering about society and what will come about … Essentially, we have inherited the principle of basic goodness, which can be a dynamic and socially transformative principle. The Shambhala principle is not simply medicine for ourselves. This principle can be applied to the social mosaic of the world we are living in.